Update: according to the OLED Association, Samsung in fact does plan to launch the first plastic based OLEDs in 2013, and these will be used in the Note 3 phone/tablet (will ship in Q4 2013). Samsung officially launched their YOUM flexible OLED displays at CES 2013, and many hoped that they will be able to start producing those displays in 2013. Now it is reported that the company still hasn't managed to overcome the technical issues with their encapsulation technology - and they may have to delay their introduction of the flexible panels. Samsung's current encapsulation technology is Vitex's multi-layer technology which is very slow (the panel has to enter the evaporation chamber 6 times). Samsung is busy upgrading this technology, and according to the new reports, they managed to shorten the encapsulation process. But apparently this is not enough for mass production yet. We do know that Samsung is also looking at other options. One possible candidate for Samsung is UniversalDisplay's UniversalBarrier, and we know that Samsung are evaluation this technology. UDC has a working 6" R&D deposition machine for the encapsulation layer, but it's not ready for Samsung's Gen-5.5 line yet. All of this isn't surprising, really. In December 2012 I posted on Samsung's flexible OLED program - and indeed my conclusion was that the company isn't really ready to start mass production, with the main obstacle being the encapsulation process. It seems that this is still the case, and it's unlikely for Samsung to achieve mass production in the near future. Is Samsung developing ALD encapsulation with Synos (Veeco)? 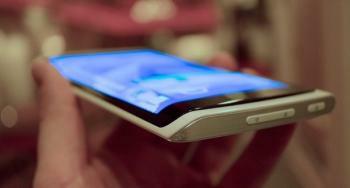 Thoughts about Samsung's flexible OLED program, is 2013 plausible? Samsung delays flexible OLED mass production?